Built: 10th to mid-12th century. Ownership / Access: Private. Open to public. 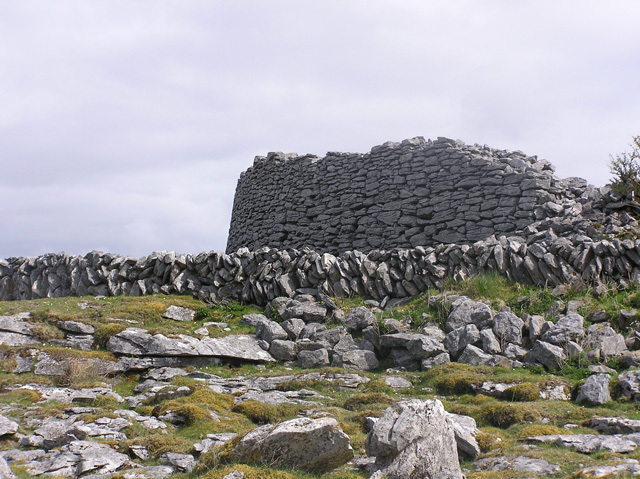 Notes: Caherconnell (Irish: Cathair Chonaill, meaning "Conall's stone ringfort") is a medieval, exceptionally well-preserved stone ringfort in The Burren of County Clare, Ireland. It lies about 1 km south of the Poulnabrone dolmen. According to Radiocarbon dating conducted in connection with an archaeological dig in the summer of 2007, the ringfort mostly dates from the early 10th to mid-12th century. Occupation deposits indicate the fort was used from around the early 10th century to the early 13th century. The later structure A with a rectangular outline was likely built between the early 15th and mid-17th century. Findings indicate that the inhabitants not only consumed relatively high-status items but were also manufacturing them at the site (pin-making mould). There seems to have been precious metal work going on and there are signs of ironworking (slag, possible anvil position). The archaeological report also notes that: "The imposing morphology of the site, its walls and diameter, sets it apart from the vast majority of cashels in the Burren". The relatively long use - well into modern times - is attributed to the fact that the area was not directly affected by Anglo-Norman influences but remained culturally Gaelic for a long time. The ringfort is open to the public. The owner runs a visitor centre with an audio visual presentation. From summer 2010, Caherconnell has been home to an archaeological field school where students can learn archaeological techniques from leading archaeologists.